W Ahmed, E Umana, P Jack. Intercoronary Communications In The Absence Of Obstructive Coronary Artery Disease: A Rare Entity. The Internet Journal of Cardiology. 2001 Volume 1 Number 2. Intercoronary communications in the absence of obstructive coronary artery disease is an extremely rare entity with a reported incidence of less than 0.02%. We report two consecutive cases of this anomaly. To our knowledge this is also the first reported case of an intercoronary communication associated with a coronary to camera fistula. Congenital coronary artery anomalies are rare. They have been reported in approximately 1% of cardiac catheterization cases in different series (1, 2). In most cases patients are asymptomatic and they are discovered as incidental findings during cardiac catheterization or autopsy. Large communications between coronary arteries in the absence of obstructive coronary artery disease are extremely rare. In different series, their incidence has been documented in less than 0.02% of patients undergoing cardiac catheterization. We report the cases of two patients with large intercoronary communications in the absence of obstructive coronary artery disease. 51-year-old female with history of hypertension and stage IV infiltrating ductal carcinoma receiving chemotherapy with doxorrubicin and cyclophosphamide was found with depressed systolic function by MUGA following her third cycle of chemotherapy. She did not have any significant symptoms suggestive of heart failure and her physical examination was unremarkable. Right and Left Cardiac Catheterization with endomyocardial biopsy were scheduled for further evaluation. She was found to have preserved systolic function by left ventriculogram, which was later confirmed by two-dimensional echocardiogram. 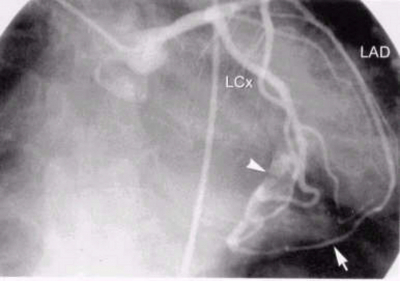 Her coronary arteries were without any significant coronary artery disease but a intercoronary communication between the right coronary artery (RCA) at the level of the posterior left ventricular (PLV) branch and the distal left circumflex (LCx) artery was noted (Figure 1-3). In view of her normal systolic function, right heart catheterization and endomyocardial biopsies were not performed. 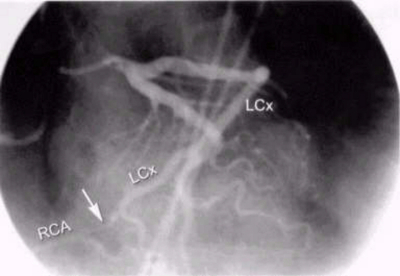 Fig 1: Selective right coronary angiography in AP – caudal view shows the PLV branch of the RCA communicating with the distal LCx. The communicating artery (arrow) measures approximately 0.8 mm in diameter and 8 mm in length. 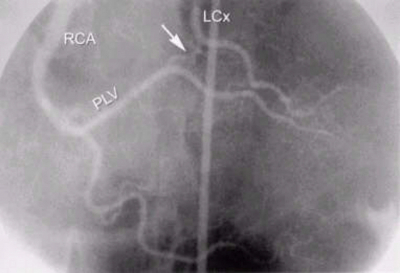 Fig 2: Simultaneous right and left coronary angiography in straight – AP view shows the communication (arrow) between the distal RCA and the LCx. 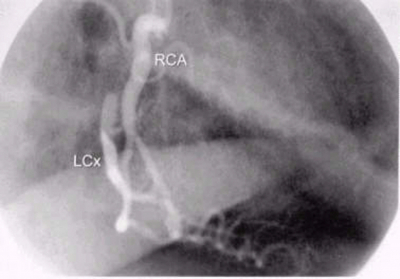 Fig 3: Selective RCA injection in RAO – 30º reveals retrograde opacification of the LCx via the distal communication. 57-year-old female without significant past medical history who presented with a two week history of exertional dyspnea, lower extremity edema, paroxysmal nocturnal dyspnea, orthopnea and cough. Physical examination revealed blood pressure of 132/82 mm Hg, pulse 82/min; on cardiac auscultation a grade 2/6 holosystolic murmur loudest at the apex and a third heart sound gallop were appreciated; pulmonary auscultation revealed bilateral rales over both lower mid fields; 2+ lower extremity edema was found. Transthoracic echocardiogram revealed a left ventricle normal in size but with depressed systolic function and an estimated ejection fraction of 25-30%; the mitral valve was found to be stenotic with echocardiographic characteristics of rheumatic mitral stenosis. Cardiac Catheterization revealed moderate mitral regurgitation, coronary arteries without significant coronary artery disease, a large fistulous communication between the second diagonal and the left circumflex coronaries and another fistula communicating the distal left circumflex coronary artery with the left ventricle (Figures 4 -5). The patient was referred for Mitral Valve replacement. Intraoperative transesophageal echocardiogram also demonstrated the coronary to left ventricular communication. Patient underwent successful mitral valve replacement and ligation of the coronary to left ventricle fistula. Follow up echocardiogram 6 weeks post-operatively revealed an improvement in left ventricular systolic function, with an estimated ejection fraction of 45%. 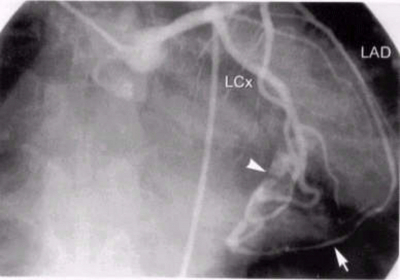 Fig 4: Selective left coronary angiography in AP – caudal view shows the LAD and distal intercoronary communication (arrow) with LCx. The arrowhead denotes the fistulous communication between LCx and the left ventricle. Fig 5: Selective left coronary injection in straight – AP view again reveals the fistulous communication (arrowhead) between the LCx and the left ventricle. Communications between coronary arteries in normal hearts are well documented in anatomic studies. These communications form the coronary collateral circulation and range from 20 to 350 in diameter (3, 4) and are not routinely visualized during coronary angiography. In the presence of obstructive coronary artery disease, these collaterals progressively dilate in an attempt to mitigate the severity of myocardial ischemia and necrosis. Rare cases of angiographically evident intercoronary communications in the absence of obstructive coronary artery disease have been reported in the literature. The first documented case was reported by Cheng in 1973 (5). Since then, only a total of 11 cases of intercoronary communications in the absence of coronary artery disease have been reported in the literature (1,5,6,7,8,9,10,11,12). Its true prevalence in the general population is not known, but in different angiographic series its incidence has been documented to be approximately 0.02% (table 1). At our institution we have found only these two cases during the last 5,000 consecutive coronary angiograms with an incidence of 0.04%, similar to previously reported studies. Table 1: Incidence of intercoronary communications in various studies. Anatomically and angiographically, collateral vessels and intercoronary communication appear to be different. Those collaterals that develop in the presence of obstructive coronary artery disease are usually less than 1 mm in diameter and appear tortuous and twisted with a corkscrew shape, whereas intercoronary anastomosis in the absence of obstructive lesions tend to be straight or gently curved (6). Histologically they also appear to be different: collaterals that develop in the presence of obstructive coronary artery disease are composed of endothelium supported by poorly organized collagen, muscle, and elastic fibers, whereas intercoronary communications are similar to an epicardial vessel with a well defined muscular layer (7). Of the eleven cases reported in the literature, seven cases have involved a communication between RCA and the LCx. The other four reported cases have involved a communication between the left anterior descending (LAD) and the RCA. All cases but one have involved the RCA at the level of the PDA. The only case that did not involve the PDA, also involved the RCA but at the level of the conus branch. Our first case represents the most commonly observed intercoronary communication: a right coronary artery communicating with the left circumflex at the level of the PDA. Our second case represents an unusual combination not previously reported in the literature: a communication between the LAD at the level of the second diagonal with the left circumflex coronary artery. It also has a second associated coronary anomaly: a coronary to camera fistula communicating the circumflex coronary artery with the left ventricle. To our knowledge this is the first reported case of an intercoronary communication and a coronary to camera (circumflex to left ventricle) fistula documented in the same individual. Of interest is an observation made by Matsuda et al (13) who reported the development of collateral vessels in some patients with severe coronary artery spasm and no obstructive coronary artery disease. It is possible that repeated episodes of coronary spasm lead to the development of these intercoronary communications even in the absence of obstructive coronary artery disease. Intercoronary communications in the absence of obstructive coronary artery disease are exceedingly uncommon. We have reported two different cases of such rare entity. Our first case, a communication between the RCA and the LCx, is the most commonly reported. Our second reported case is unique: it is the first reported case of an intercoronary communication between the LAD and the LCx and also the first reported case where an intercoronary communication has been associated with a coronary to camera fistula. The clinical significance of intercoronary communications is uncertain. It is probably a benign anomaly and may actually have a protective role if obstructive coronary coronary lesions develop in any of the involved vessels, serving as a large collateral to minimize myocardial ischemia. These cases also illustrate the interventional cardiologist should recognize that congenital intercoronary communications although very rare can be present in patients with angiographically “normal” coronary arteries.